Anchor locations throughout the country have been celebrating our half-century and raising funds for the charity Contact The Elderly. Generous suppliers to Anchor have made contributions towards the 50th parties and Anchor’s anniversary fund-raising drive for Contact The Elderly. Thanks to suppliers’ generosity, over £20,000 in cash or in kind was raised – with more being collected through fund-raising at many of the parties. 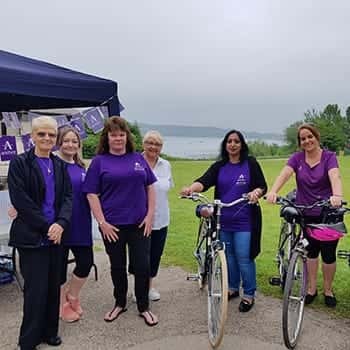 Locations were encouraged to help raise further funds from activities including sponsored bike rides, village fetes and bring & buy sales and so far have raised several thousand more. Bolton’s Stevenson Court and Topphome Court, raised over £400 from a fete. Enterprising scheme manager Sue Poynter said: "We had an amazing turnout with over 90 people between the two locations of Stevenson and Topphome with tenants, families, and neighbours all turning up in great numbers. The stalls were all busy. We had queues for the refreshments, loads of prizes for the raffle and the entertainment was great! I must say a really big thanks to our sponsors Forrest and Ian Williams, both of whom who had already centrally donated funds following Jane’s letter." In Willowbank, Cambridgeshire, Team Manager Rebecca Bradley hosted a garden party: "Our 50th birthday included a BBQ, a singer, craft stalls, afternoon tea and jewellery sales. It was attended by residents, their friends and families and people from our local community. Altogether we managed to raise over £450 for Contact the Elderly. I am very proud of my colleagues and customers who all chipped in to make the day a great success." She joked: “I told a little white lie when I said to the cyclists there were only a couple of hills but a big thanks to all who contributed - you were all fantastic." Anchor suppliers Barons Furniture, Brake Brothers, Engie, HG Forrest, Ian Williams, Knightsbridge, MC Contracts, Tooley & Foster, Total Property Support and Veriserv all contributed to the anniversary fund-raising. Anchor Chief Executive Jane Ashcroft said: "Contact The Elderly do an absolutely brilliant job of holding thousands of monthly tea parties all over the country for small groups of people aged 75 plus. They rely hugely on volunteers who give up their time and their homes for the events. I am very proud to say I am one of those volunteers. Thank you to everyone who has contributed so far, whether as a supplier, scheme manager or colleague. It’s a wonderful way to celebrate the fact that we have been providing services to older people for half a century and the fund-raising will make such a difference for Contact The Elderly."